When split, the meat can be extracted and eaten. Walnuts can be consumed both raw or roasted, and salted or unsalted. The nutritional profile of walnuts shows why many dietitians recommend the food for regular consumption. Walnuts are round, single-seeded fruits of the walnut tree in the genus Juglans. The trees are native to North America but are commonly grown in China and Iran. After ripening, the green husk of the walnut is removed to reveal the wrinkly nut. When split, the meat can be extracted and eaten. Walnuts can be consumed both raw or roasted, and salted or unsalted. The nutritional profile of walnuts shows why many dietitians recommend the food for regular consumption. Here are the 7 health benefits of walnuts. 1. Walnuts may help protect against heart disease. A 2009 literature review published in the American Journal of Clinical Nutrition investigated 13 studies representing 365 participants. The researchers concluded that a diet providing 10 to 24 percent of the total calories could significantly decrease the total and LDL cholesterol for short term. LDL cholesterol is called “bad” cholesterol because it contributes to fatty buildups in the arteries and plaques leading to various types of heart disease. Another study published in the British Journal of Nutrition suggested that people who consumed nuts more than four times per week had a 37 percent decreased the risk of coronary heart disease compared to individuals who never or rarely ate nuts. Walnuts are rich in omega-3 fatty acids and other fatty acids like oleic acid, linoleic acid, alpha-linolenic acid and arachidonic acids, which could help prevent coronary heart disease. 2. Walnuts could help decrease the risk of type 2 diabetes. A study published in The Journal of Nutrition investigated the link between walnut intake and the rate of type 2 diabetes in about 130,000 women. They suggested that higher walnut consumption is liked to a significantly decreased risk of type 2 diabetes in women. 3. Walnuts may help you manage your weight. Research published in the American Journal of Clinical Nutrition found that women who ate nuts two times or more per week had a lesser incidence of weight gain over a period of 8 years. 4. Walnuts could help reduce inflammation. A study in The British Journal of Nutrition researched the effects of Walnut extract and the ellagic acid in walnuts. They found that walnuts could reduce the impact of inflammation in the body. Chronic inflammation could cause various complications like heart disease, cancer, diabetes, Alzheimer’s disease, and chronic lower respiratory disease. 5. Walnuts may help reduce blood pressure. Walnuts contain an amino acid called L-arginine. L-arginine supplementation has been found to play a vital role in reducing blood pressure, which can be essential for individuals with hypertension. 6. Walnuts could help improve your mental capabilities. 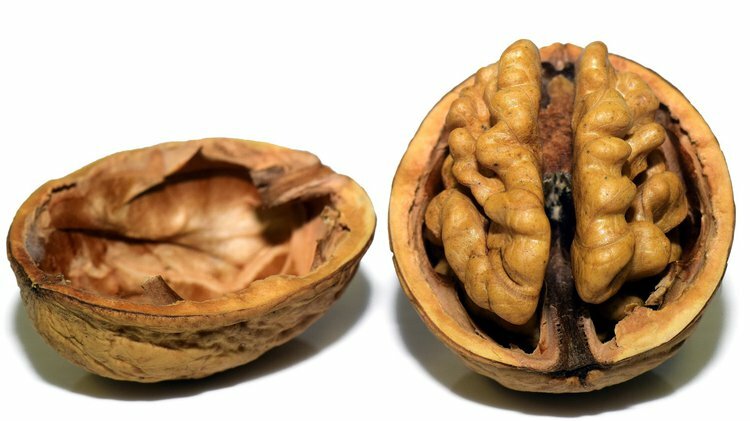 An animal study published in the Journal of Alzheimer’s Disease suggests that adding walnuts to your diet could improve your memory and learning as well as reducing your anxiety. However, more research needs to be done since the study was conducted on mice. 7. Walnuts could decrease the risk of gallstone disease. A 2004 study in The American Journal of Clinical Nutrition researched the correlation between nut consumption and the risk of cholecystectomy, the surgical procedure to remove the gallbladder, in women. They found that women who consumed at least five ounces or 143 grams of nuts had a significantly reduced risk of cholecystectomy. 1. Banel, D. K., & Hu, F. B. (2009). Effects of walnut consumption on blood lipids and other cardiovascular risk factors: a meta-analysis and systematic review. The American journal of clinical nutrition, 90(1), 56-63. 2. Trialists, C. T. (2010). Efficacy and safety of more intensive lowering of LDL cholesterol: a meta-analysis of data from 170 000 participants in 26 randomised trials. The Lancet, 376(9753), 1670-1681. 3. Kelly, J. H., & Sabaté, J. (2006). Nuts and coronary heart disease: an epidemiological perspective. British Journal of Nutrition, 96(S2), S61-S67. 4. Pan, A., Sun, Q., Manson, J. E., Willett, W. C., & Hu, F. B. (2013). Walnut consumption is associated with lower risk of type 2 diabetes in women. The Journal of nutrition, 143(4), 512-518. 5. Bes-Rastrollo, M., Wedick, N. M., Martinez-Gonzalez, M. A., Li, T. Y., Sampson, L., & Hu, F. B. (2009). Prospective study of nut consumption, long-term weight change, and obesity risk in women. The American journal of clinical nutrition, 89(6), 1913-1919. 6. Papoutsi, Z., Kassi, E., Chinou, I., Halabalaki, M., Skaltsounis, L. A., & Moutsatsou, P. (2008). Walnut extract (Juglans regia L.) and its component ellagic acid exhibit anti-inflammatory activity in human aorta endothelial cells and osteoblastic activity in the cell line KS483. British Journal of Nutrition, 99(4), 715-722. 7. Ast, J., Jablecka, A., Bogdanski, P., Smolarek, I., Krauss, H., & Chmara, E. (2010). Evaluation of the antihypertensive effect of L-arginine supplementation in patients with mild hypertension assessed with ambulatory blood pressure monitoring. Medical Science Monitor, 16(5), CR266-CR271. 8. Muthaiyah, B., Essa, M. M., Lee, M., Chauhan, V., Kaur, K., & Chauhan, A. (2014). Dietary supplementation of walnuts improves memory deficits and learning skills in transgenic mouse model of Alzheimer's disease. Journal of Alzheimer's Disease, 42(4), 1397-1405. 9. Tsai, C. J., Leitzmann, M. F., Hu, F. B., Willett, W. C., & Giovannucci, E. L. (2004). Frequent nut consumption and decreased risk of cholecystectomy in women. The American journal of clinical nutrition, 80(1), 76-81.